Jessie and Josh Boyce had secured the best-paying, most stable careers they’d ever had when they moved to Florida in 2013. Jessie taught sixth-grade math, and Josh was an IT professional. They felt like they had some financial breathing room. They moved into a condo, bought furniture and replaced their old cars. They also had student loan debt, which didn’t bother them much. Debt was just part of life, they figured: You borrow money to go to college, then borrow to finance a car or maybe a house, and payments are pretty much forever. At least theirs would be. Between them, they had four degrees and $111,000 in student debt. But living in St. Petersburg opened their eyes: They met young retirees who were financially independent. The idea that you could not only become debt-free but also amass enough savings so that earning more money was optional was a new concept; neither of their families had done that. Despite being in a big hole to start, the Boyces decided to try to make that happen in March 2015. When they started, their combined income was about $95,000 a year. They became debt-free three years later, in May 2018. Now they blog about financial freedom at Mindful Money Habits. 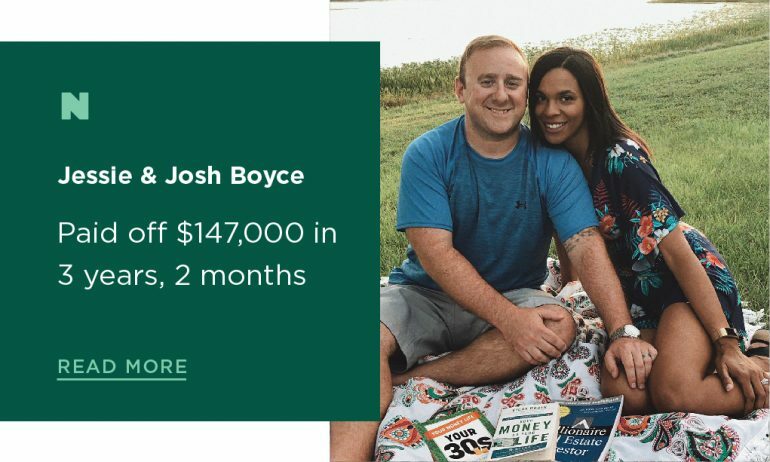 Josh: About $147,000: $111,000 in federal and private student loans, and the rest because of new cars, bedroom furniture and credit card debt. Josh: No one taught us how to get through college without burying ourselves in student loans. I think a lack of education … got us into the start of our trouble. Jessie: We thought debt was normal, and it would always be part of life. Jessie: When we moved to Florida, we ended up having some neighbors who were very knowledgeable and had retired early. We realized that it was something we could do as well — that we didn’t have to be in all of this debt that we just thought was a normal part of life. We used to very much have the attitude that we’d just be paying the minimums for the rest of our lives. … We saw people living in a totally different way. Josh: Being surrounded by the right people opened our eyes and changed how we viewed our finances. Josh: The first step was awareness. We learned to track our expenses, and that was probably our most eye-opening moment. We created a zero-based budget using our stable monthly income. We allocated every dollar. This goes to groceries, this goes to rent. Whatever was left over, we used to aggressively pay off debt. Any money above and beyond our stable income went to debt payoff. Jessie: The first month we only had an extra $30 in our budget to put toward debt repayment. Josh: We became more intentional with our money. We sold one of our cars and bought a beater. Then, a year later, we got even more aggressive and got down to one car. We were basically driving the same way at the same time to get to work anyway. We also had side hustles. I did some computer repair and consulting, and Jessie tutored, freelanced and baked wedding and birthday cakes [she has a home bakery]. By the end, we were paying down $2,000 in debt per month. Jessie: We’re both very competitive people, so it became like a game to us. We were like, “OK, let’s see how many things we can sell in the house.” I liked making a game about what kind of meals we could have with the food in our pantry. … We were really focused on our budget, too. We had a dry-erase wall in our bedroom, and every month we would write where we went over or under budget. We had to revamp the budget a whole bunch of times. Josh: We listened to a lot of podcasts and read books and used online resources. We made our own budgeting spreadsheets. And we used a combination of snowball and avalanche methods to pay it off. We continued to save for retirement, but we only saved enough to qualify for an employer match. Jessie: I received an inheritance of about $20,000, all of which went to debt, when my father died and his house was sold. I also had loan forgiveness of $17,500 in federal loans because I teach math at a Title 1 school. And a teaching award [Pinellas County Teacher of the Year] included $5,000 cash, which went to paying off debt. Josh: The main thing I would do differently is to not take out student loan debt. Or maybe I would have slashed expenses even more at the start. But we started small, by skipping coffee trips, and then cut more as we went. Josh: Our endgame is financial independence. Debt payoff was just one step in that process. We are “saving to buy our freedom.” We want to have freedom to make choices not based on money. Now we can save more. And it will accumulate more quickly than the debt balance dropped. Jessie: We don’t feel like we have sacrificed our quality of life at all. We live in a beautiful condo, on a lake, minutes from the beach. We didn’t sacrifice and eat rice and beans for months and months. We really aim to keep doing what we’ve been doing. Jessie: In some ways, it hasn’t changed at all. But there’s less pressure — I just got a new cell phone. It was more than I would normally pay, but we knew it was OK. And a second car is not out of the question if we need one. Josh: Right now, we go to work together, and if one of us needs a car when the other has it, we use Lyft. A $15 ride from time to time is a lot cheaper than owning a second car. But the less we have, the freer we feel. I really think the more stuff you have, the more time and money it takes to maintain it. We are more free to give time and money partly because we don’t have a lot to take care of. Track where money goes. You may be surprised at exactly how you are spending and may see opportunities to steer more of your money to goals that are important to you. Draw up a budget. But remember that it’s a flexible document. If you go over in one category, you’ll need to cut back in another to make up the difference. Attack from both sides. Slash expenses, but also consider side jobs to help you increase income to pay off debt more quickly. Immerse yourself in learning about money. Websites, podcasts and books can help — and they can keep you inspired. Have an emergency fund. Josh and Jessie were able to cover unexpected dental expenses by using a fund set aside for the unexpected. Photo courtesy of Josh and Jessie Boyce.